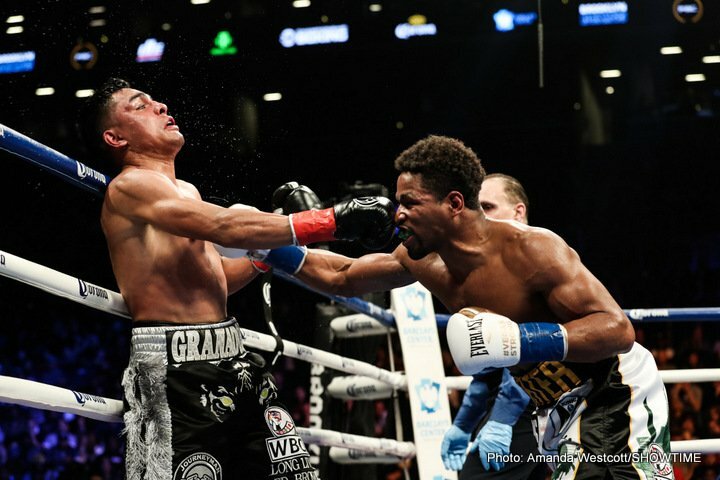 Former welterweight champ Shawn Porter never disappoints. Last night on the under-card of the Wilder-Stiverne rematch blowout, Porter decisioned a game Adrian Granados over 12 in an eliminator. Porter, who won by scores of 117-111 X3, is now 28-2-1(17). Granados, another warrior who is always involved in good action fights, is now 18-6-2(12). Porter had one thing on his mind prior to last night’s imporatnt win and he has one thing on his mind now: a return fight with Keith Thurman. As fans know all too well, Thurman and Porter went to war in a great, great action fight in June of 2016, and Porter, having dropped a close 12 round decision, instantly made it clear that he wanted a rematch. With last night’s ninth round win Porter won yet another final eliminator for the WBC welterweight title Thurman currently holds, along with the WBA belt. Since his tough win over Porter, Thurman has boxed just once, winning a split decision over Danny Garcia. Since then, Thurman has been out due to injury, expected to return in early 2018. And Porter has again made it clear he is ready and waiting to welcome him back to the rigours of the ring. Porter, really something of a mini-Joe Frazier, might get a little careless in fights, but his high intensity approach is what makes him so good to watch. Porter is also great fighter to look at if a young boxer wants to see what he should do when his opponent tries to hold. There are no “breathers” for any fighter when he’s in their with Porter – Thurman included. That rematch, if and when it happens, will result in more stupendous toe-to-toe action. The first fight was a genuine Fight of The Year candidate (winning the award in certain quarters) and there really is zero reason to believe fight-two will be any different. The welterweight division is arguably the best, most exciting and talent-rich in boxing today and Thurman-Porter II is arguably the best guaranteed action fight the 147 weight class has to offer.